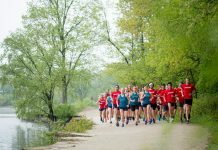 With the warm days of summer, the lakefront path, our forest preserves and even city streets around Chicago are filled with runners, many preparing for a fall marathon. 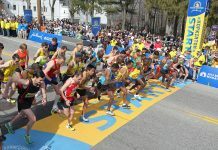 Whether you are training to qualify for Boston, set a personal best or complete your first marathon, positive results are predicated upon good training and goal setting. I encourage my runners to start each training program with specific goals in mind. Goals should be based on the experience level of the runner and be both reasonable and achievable; and be measured against objective criteria such as a recent race which provides solid evidence of training paces and projected marathon finish. Once the goals are set, do your own training. Many runners mistakenly measure themselves against a friend or family member, or even the runner they were many years ago. Consider the time you have for training, your experience level and how the training fits your current life situations – and foreseeable changes. Review the entire training schedule (18 to 20 weeks) and study the cumulative mileage and time required for the training to assure that you can safely meet those requirements. I recommend a base of at least 15 to 20 miles a week for eight to 12 weeks before embarking on a continuous running marathon program. If you are running less than that, consider either an entry-level run/walk training program or delay your marathon until a point where you can build to that level before marathon training begins. Weekly mileage should increase by no more than 10 percent each week. And after each three to four weeks of increased mileage, a ‘cutback week’ of 15 to 20 percent is advised. The most common mistake I see among runners of all levels is doing too much too soon in training, with inadequate rest and recovery. 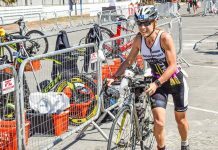 Starting a training program with an inadequate base, increasing mileage or the intensity level of training too quickly invites injury, fatigue or burnout long before race day. Be sure to select a training program that does not overload your system on mileage. Two components to training are the total weekly mileage and the pace of the runs. Training for a marathon should include three to five days a week of running, one to two days of cross-training and one to two days of rest and recovery each week. Aggregate mileage, number of days running, cross-training and rest depend on the experience level of the runner. The program should focus on ‘quality’ of the workouts, not ‘quantity’ of miles. For first-time marathoners, aggregate weekly mileage will top out around 40 miles. For experienced runners with aggressive goals, the total will be significantly higher. Not every workout should be run at the same pace. A combination of ‘hard’ and ‘easy’ workouts develops the best results – stressing the body on hard days while allowing for recovery and adaptation on easy days. Different paces work muscles and the cardiovascular system differently, yielding better performance. Marathon training is comprised of three phases – base-building, sharpening and taper. These are not equal in duration and may vary depending on the runner’s adaptation to training. The longest period is the base-building phase when mileage increases the most and is marked by slower paced runs. The sharpening phase is the time for increased intensity – speed work and some faster paced runs mixed with adequate recovery. Finally, the taper phase, usually the last three weeks of marathon training, where mileage is reduced and we hone in on marathon pace. Key workouts each week should include a long run, a speed or strength run and a medium distance run. Additional runs (at an easy pace to improve performance and to allow the body to recover from the higher intensity workouts) may be added. The speed or strength run should be incorporated only after building a solid base, at least six to eight weeks into training; these workouts should be done at 5K to 10K pace, and constitute less than 10 percent of total weekly mileage. The medium distance pace should approximate half marathon pace or slightly faster. And the most important workout – the long run, should be run at a pace which is approximately 70 percent of your current 5K race pace for maximum benefit and constitute a third to half of total weekly mileage. Maintain a training log throughout the season. Write down information each day, regardless of the workout or a rest day. Indicate how you feel, weather conditions, any soreness – even something which seems inconsequential – and the shoes you wore. A training log provides valuable information later in the season – guidance to diagnose injuries or overtraining – and serves as a reminder of your progress. By setting reasonable goals, following a good training program and keeping a training log of your progress, you are on your way to a successful marathon.